He could have been talking about European monetary policy or maybe even the majority of Swedish central bank board members…at least Gustav Cassel would have agreed. I have always been a huge fan of the Shadow Open Market Committee (SOMC). However, it is having a much less prominent role in US monetary policy debate today than used to be the case in the good old days. A reason is that the SOMC played a very important role in as a counterweight to the Federal Open Market Committee when the Federal Reserve really did a bad job back in the 1970s. However, during most of the Volcker-Greenspan period the conduct of monetary policy in the US became much closer to what was being advocated by the SOMC members. That led to the SOMC to becoming less interesting as constant critique of the Federal Reserve and the SOMC star therefore faded somewhat both in the media and in academia. However, now it should be time for a comeback for the SOMC as the performance of the Federal Reserve over the past four years would certainly not have been praised by monetarist lighthouse Karl Brunner who founded the SOMC in 1973. Unfortunately for me the SOMC has been as – if not more -disappointing as the FOMC over the past four years. Hence, most SOMC members of the past four years seem to have taken a rather Austrian and often also an overtly (partisan) politicized view of the crisis rather than a monetarist view of the crisis and it is notable that the majority of SOMC members have failed to endorse the Market Monetarist revolution – which in my view is the second monetarist counter-revolution. 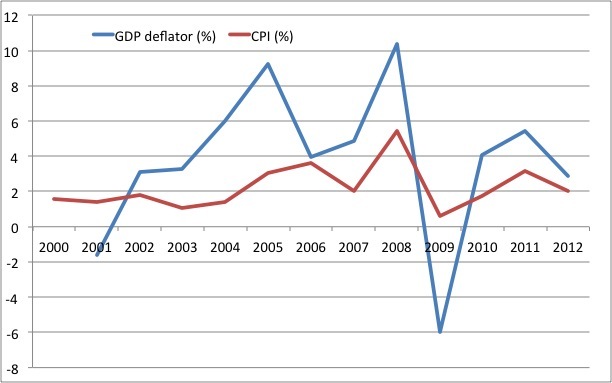 The SOMC over the past four years has not been the intellectual monetarist force that it used to be in 1970s. That role instead has been played by Market Monetarist bloggers – most notably of course by Scott Sumner. However, that could change in the future. In fact why are Scott Sumner, David Beckworth or Josh Hendrickson not already members of the SOMC? That siad in someway we are getting there. A notable exception to the present “the Fed is going to create hyper-inflation”-view on the SOMC is Peter Ireland. In my view Pete’s 2010 paper on the Great Recession is a basically Market Monetarist account of the causes of the Great Recession. 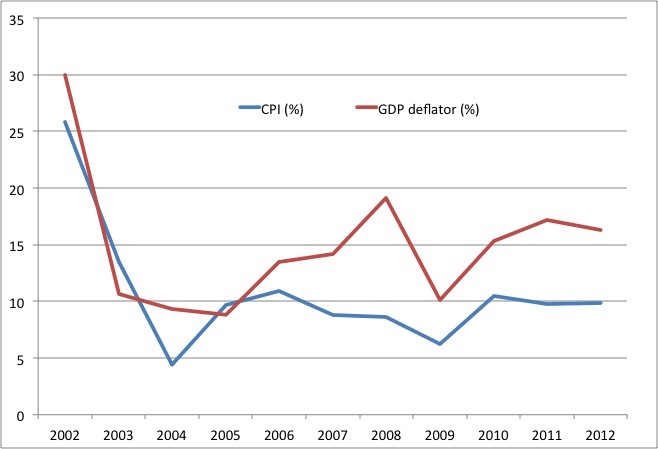 In his paper Pete shows how the crisis was caused by the fed’s overly tight monetary policy. In the words of Bob Hetzel – it was monetary policy failure rather than market failure that caused the Great Recession. Unfortunately the majority of member on the SOMC don’t seem to agree with Pete on this. Pete’s membership of the SOMC is clear positive and I am therefore also happy to recommend his latest paper – Refocusing the fed – which he presented at the latest SOMC meeting on November 20. I agree with 99.9% of what is in Pete’s paper. My only regret is that Pete does not endorse NGDP level targeting in his paper, but instead maintains the SOMC “party line” and endorses inflation targeting. While I am critical of what have been the “majority view” on the SOMC over the past four years I remain an admirer of most of the members of the SOMC and I do think that the SOMC is a great institution and I would hope that more countries would have similar institutions, but I also hope that the SOMC in the coming years will move more in a Market Monetarist direction. Even though I think the primary economic problem in the US and in Europe at the moment is weak aggregate demand due to overly tight monetary policy I certainly do not deny the fact that both the US and the euro zone face other very significant problems. Among these problems are considerable “regime uncertainty”. In fact I believe that regime uncertainty is the key economic problem in a number of countries such as Venezuela, Argentina and Hungary. I have in earlier posts (see links below) argued that regime uncertainty primarily should be seen as supply side phenomena. However, regime uncertainty can also be seen as a demand side problem. In today’s guest post the young and talented Alex Salter discusses a framework in which to discuss regime uncertainty or policy uncertainty – both as a supply side and a demand side phenomena. I think Alex’s discussion is highly relevant and is quite useful in understanding regime uncertain conceptually . There’s been some talk lately about policy uncertainty and its effect on economic activity. It’s important to pin down just what economic effects we’re talking about here. In particular, we need to decide whether policy uncertainty (also called ‘regime uncertainty’ by economist Robert Higgs, who was talking about it before it was in vogue) is a demand-side or a supply-side phenomenon. I’ve seen arguments for both sides. Here’s my take on it: In the short-run it’s a demand phenomenon. But it has long-run supply consequences. Policy uncertainty stems from uncertainty with respect to the future structure of property rights. If I’m not sure what regulatory policy, tax liability, etc. for various economic activities will look like, then there’s a real option value to holding off on investing in an enterprise (Avinash Dixit has some really interesting papers on this). This, of course, means lower investment spending than there would be otherwise. The standard Aggregate Demand-Aggregate Supply (ADAS) framework provides a quick-and-dirty way of looking at this. First off, let’s work in growth rates instead of levels. I think it makes the analysis easier. The AD curve is given by. This is the dynamic form of the familiar quantity equation,. The little g denotes growth rates. Note that the AD curve shows all combinations of inflation and real income growth that map to a constant level of nominal income growth. AS is, as usual, broken down into short-run and long-run components. 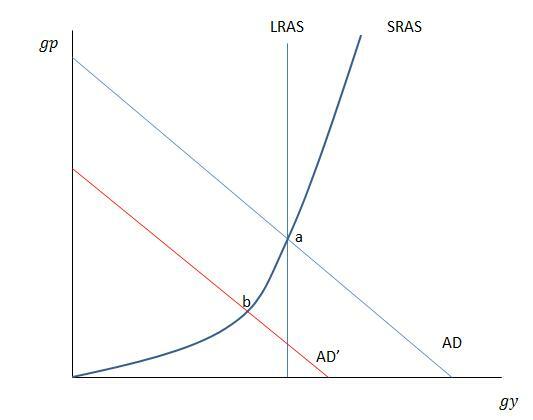 SRAS is a standard Lucas supply curve, which is an increasing function of inflation expectations. LRAS depends on the real productive capacity of the economy; it is vertical to reflect long-run monetary neutrality. 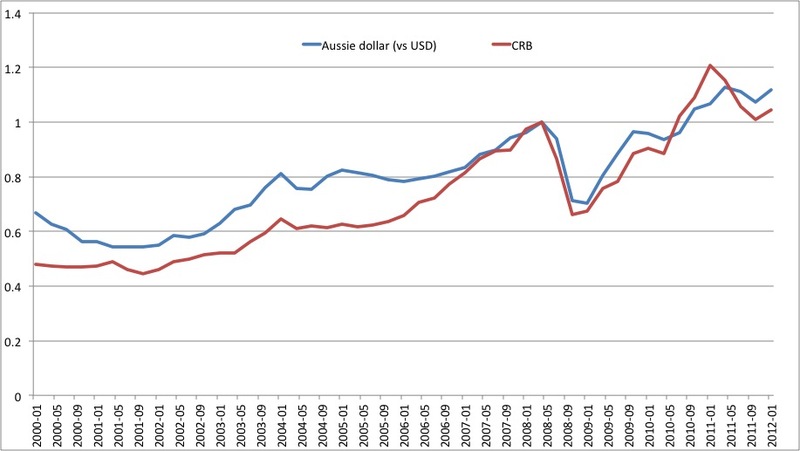 The economy, initially in long-run equilibrium at point a, moves to point b, below its long-run potential growth rate. 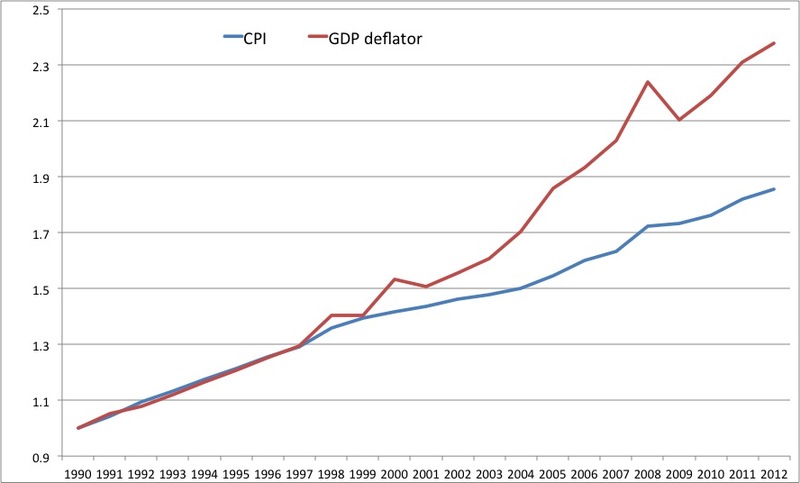 Ordinarily, the reduction in money flows throughout the economy would put downward pressure on prices, leading to disinflation (or outright deflation if the shock is big enough). 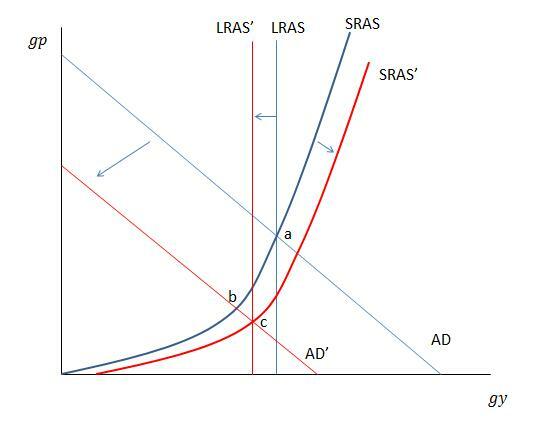 The SRAS curve would shift down as the economy adapted to the new expenditure pattern, bringing us back to long-run equilibrium with the same growth rate as point a, but lower equilibrium inflation. As I have drawn it, the inward LRAS shift meets the transition down AD’ (reflecting larger income growth relative to inflation growth over time, still yielding a constant level of nominal income growth). The result is long-run equilibrium at point c. Again, real income growth is permanently lower because regime uncertainty, by hampering capital formation, has reduced the economy’s real productive activity vis-à-vis the no-uncertainty world. This is obviously an oversimplified (and overaggregated!) model, but I think it captures the short-run/long-run distinction well enough for the purposes of getting our thinking straight. There are all sorts of bells and whistles you could add to this. For example, you could look at what happens after the uncertainty plays out (property rights become better-defined, either at a permanently “stronger” or “weaker” level). The new equilibrium would be different depending on how you model actor expectations (rational, adaptive, etc.) The grad students out there might want to spice things up by examining this in a Ramsey-style model and playing with the dynamics. Now that we’ve got our terminology squared away, we can proceed to the really interesting questions—namely, how regime uncertainty plays out at the micro level, with the accompanying distortions in relative prices (and thus resource misallocations). There are all sorts of political economy implications to work through as well.